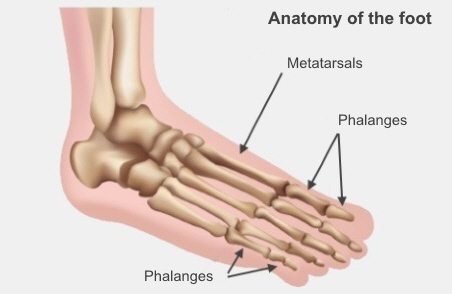 Pain in the ball of your foot (on the sole, near your toes) is called metatarsalgia (met-a-tar-sell-gee-a). It comes from the word metatarsals (which are the long bones that run between your ankle and your toes) and "algia" which means pain. It can be caused by several different conditions. The pain often comes on gradually over some weeks, rather than suddenly, and is worse when you're standing, walking, or running. You can get pain in one foot or both feet, and under just one spot or across the width of your foot. Your health professional will probably be able to work out what's causing your pain without any specific tests. They might recommend you have an X-ray or blood test. Occasionally an ultrasound or bone scan can help to reveal the problem. stretch out your Achilles tendon, calf, or ankle if they are stiff. The Long calf stretch and Short calf stretch are useful. use simple pain relief such as paracetamol or ibuprofen (check with your pharmacist or doctor if you are safe to take ibuprofen). A podiatrist can help you by looking at what's causing your pain. They can help to make sure you are walking correctly, see if you would benefit from using special insoles called orthotics, wearing different shoes, or doing some stretches. They can also help you to change the way you do things to minimise pain and they can arrange for you to have further tests or assessment if necessary. If you need to find a podiatrist you can search on the Podiatry New Zealand website. Your GP can also help by looking at what's causing your pain, and arrange any further tests or assessment you need. They can advise you on simple things you can do to reduce the pain and help with pain relief. They can also help you to manage any medical condition that may be contributing to your pain. If you need to find a GP, you can search using this link. If your pain is caused by Morton's neuroma or bursitis a steroid injection might help. Talk to your GP or podiatrist about this. If your pain remains even after you've tried all these measures, you may wish to pay see an orthopaedic, sports, or musculoskeletal specialist. Written by HealthInfo clinical advisers. Page created July 2016.